I was updating an Authorware project recently and became frustrated by the inability to zoom in on areas of the presentation window. 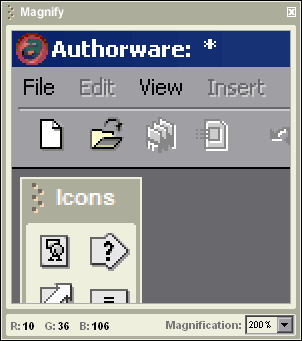 After struggling to find a comfortable work flow with a couple of the various magnifier applications for windows I remembered an experimental Authorware command that I’d built some time ago. Upon digging it out and making a small update to make it a bit more useable I can report that it seems to meet the need adequately. - Double click the palette’s titlebar area to toggle magnification on/off. -When the ‘Tools’ palette is available double click the ‘Magnify’ palette’s display region to dock next to the ‘Tools’ palette. To install extract the zip to the Authorware Commands directory. Launch the command from the Authorware Commands menu. I tried it and it works perfectly. Good work!! !